Provide comfort for the family of Mr. Randy Chambo with a meaningful gesture of sympathy. It is with heavy hearts the family of Randy Franklin Chambo announce his passing in Thunder Bay Regional Health Sciences Centre on Thursday, January 31, 2019. Randy was born on March 24, 1955 in Peterborough, Ontario to Theodore and Helena Chambo. His father lovingly gave him the nickname “Niska” which meant Canada Goose. He was very proud of his time spent in the Army in his younger years. He loved fishing, swimming and anything else to do with the water. He enjoyed spending time outdoors, playing guitar and singing. In recent years, he worked as a Chef's Assistant at the Valhalla Inn. 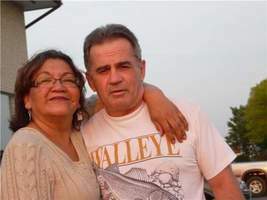 Randy is survived by his loving partner of 20 years Susan Sandau. He was the beloved father of son Darren Chambo, daughter Chauntel Eggleton; step-daughter Wendy (Devon) Meekis; step-son Jason (Rose) Stephens and grandchildren Cyanne, Mya, Kya and Nyema. Randy will be sadly missed by his brothers and sisters Donna (Larry), Dan (Nancy), Scott, Dianna, Gerry (Jacquie) and Alan. He was also loved by many cousins, aunts and uncles. He was predeceased by his parents Helena and Theodore Chambo. Cremation has taken place and a Celebration of Life will be held on Tuesday, February 5, 2019 from 11:00am to 1:00pm in the Valhalla Inn. Arrangements have been entrusted to SIMPLER TIMES CREMATION CENTRE, 332 North May Street. If friends desire, donations to the Heart and Stroke Foundation or the Sick Kids Hospital would be greatly appreciated. To plant a memorial tree in honor of Mr. Randy Franklin Chambo, please visit our Heartfelt Sympathies Store. Celebration of Life for Mr. Randy Chambo will be held, Tursday, February 5, 2019 at Valhall Inn from 11:00 am to 1:00 pm. We encourage you to share your most beloved memories of Mr. Randy here, so that the family and other loved ones can always see it. You can upload cherished photographs, or share your favorite stories, and can even comment on those shared by others.